Today’s topic is about using language to structure our fitness and practice goals to garner greater success. Certainly, there’s a lot of useful information to assist in building better results in the articles 10 Techniques for Getting the Most out of Your 10,000 hours and 6 Steps to Creating your 30 day Challenge though I’m pretty sure this topic deserves it’s own article.Have you ever been to an aerobics or group fitness class when the instructor said, “Don’t stop” as part of the call outs in the room? Or perhaps you’ve worked with a personal trainer who, in a moment when you were doing reps, said, “Don’t stop” as a means of inspiring you to keep going? For me, this really doesn’t work well. I don’t really feel encouraged to keep going, which, presumably is the result the facilitator is trying to reach. This came up for me again today while on a fitness forum where I noticed someone give a compliment on a video someone else had shared of what they’d been working on and the person then wrote, “Don’t stop” after the compliment. After experiencing some NLP training and trying out the ideas for myself, I think we can do better — both for ourselves and those we are supporting either as workout partners or clients. To begin with, NLP is the study of the structure of your subjective experience and provides tools to assist you in manipulating your own (and if you’re effective with them, other people’s) experience, ideally toward a wholesome positive end. There’s a lot to be gained in some of the ideas it’s presented to me over the past dozen years, including these thoughts. One of the things they talk about in NLP is that when we use a negative term, the mind can’t really comprehend what it is and has to produce the positive form of the statement to then negate it. As an example, when I say, “Don’t think of a pink elephant,” (for most people at any rate) the mind first thinks of a pink elephant and then tries to think of things that aren’t that. The irony is that you’re trying to get someone to think of something other than the one thing you named which now become almost too present in the mind. This isn’t dissimilar in mentality to the idea that if you always think of yourself as broke, you’ll relate to your experience through the lens of not having enough money and likely continue to foster being broke. Another example you may see in your life is people who say, “I hate drama!” and yet constantly find themselves entangled in drama. What we focus on is what we often see and surround ourselves with. This means that if we focus on what we don’t want, that’s likely what we’ll see more frequently or the result toward which we will gravitate even though we seek the opposite goals. I’ve read a lot of support for workouts especially that talk about “don’t quit” or “don’t stop” which, in my experience as a trainer and facilitator, is not nearly as effective as “keep going” or perhaps my all time favorite slogan and one of the best known, at least of my generation, “Just do it.” If you look at “don’t stop” as one action and it’s exactly the action you don’t want to take. However, you haven’t taken the time to give the viewer/reader/listener’s mind an alternative upon which to focus and subsequently create. What will they do instead of stopping? This is related to ideas I’ve looked at with “move away from” strategies and “move toward” strategies. A move away from strategy is defined in terms of something you don’t want from which you want to get away. An abused spouse may seek to get away from the abuser and the only real goal is to simply get away. At the same time, this goal does nothing to describe what happens after one has gotten away so the goal may be effective for a short term gain while it may lack vision for long term success. In contrast, a move toward strategy is about “going toward the light” so to speak, where you’re moving toward an outcome that inspires. The same spouse may, instead of seeking to “get away from the abuser,” may “create a healthy living situation that eliminates abuse” which is a far more encompassing goal that not only achieves what the first strategy suggests, it moves the spouse forward to create a new, better situation that is sustainable. Applying this idea to health and fitness, we can use my experiences as a case study of sorts. When I was just about 315 pounds at age 22 in my 5’2.75″ body — obviously incredibly obese and so much so the number is actually considered beyond “morbidly obese” — my only strategy in the moment I sort of “woke up” and realized I’d be dead by the time I was 30 at that current pace was to “not be dead by 30.” Like the example with the spouse, this strategy is based on fear — in the spouses case, fear of further abuse and in my case, fear of death. Neither move away from strategy provided much in the way of long term sustainability. Until I developed a “move toward” strategy, I really didn’t achieve sustained results which is what fitness and practice success is really about. If someone sees you practice and says, “don’t stop ever!” that can be seen as a sign of support and indeed, most likely is intended that way. The thing is, why would you want to put the idea of stopping into someone’s head, especially someone whose work you hope to see in 50 more years? Why not, instead of referencing stopping in some subtle way, point to how you look forward to seeing a new video in 10 years or some other future time that clearly speaks to an ongoing practice and ongoing improvement? For example, “Wow, if you’re this good now, I’m excited to see where you’ll be in 10 years!” Of course, as someone who has been spinning almost 15 years, that perspective may seem more relevant than it would to someone who has only spun a few years or even less. Still, for me this has been about embracing the “only forever” frame. Consider that if we take practice on as a game, the game of practice is about a deepening in knowledge at ever increasing levels of subtlety … only forever. The target is ever moving before us rather than something behind us from which to flee. It is a place to seek with possibility rather than a place to avoid, often with discomfort associated with it. Replace don’t with do — discover what you want to be doing instead of that action you’re looking to eliminate. Focus on what you want to create rather than destroy or let go of something else. This has been especially critical with respect to my body for me. Focusing on losing weight doesn’t help me actually get to my goal nearly as much as focusing on having a leaner, stronger body which yields better more measurable results and better success. Replace never with always — “I never want to eat close to bed” becomes “I always try to have my last meal 4 or more hours before bed.” For me, the shift in my body is visceral and something I can feel simply by using different words and the more positive words feel more opening in my body, as if I’m more free to flow. After discerning where my “no” lies, figure out to what I am a “yes.” This is a different form of the same game. In my younger years I might have said, “I’m a no to unhealthy behaviors” which had me focus on what unhealthy behaviors are rather than my current frame of, “I’m a yes to healthy behaviors” which has my mind looking for choices that are increasingly more healthy for me. Turn limitations into opportunities. As a chronic pain sufferer, there are many things at various times in my experience that were simply too painful for me to do. For example, until March of this year — 14 years after I started my practice — using knob poi was pretty much impossible (in a sustained manner at any rate) for me because my RSI would start hurting after a few minutes. In fact, I still don’t have enough endurance in my hands to do one handed poi for long without cramps. At first, this limitation was just that — a point of focus for what I could not do. Through time, my attention shifted to developing skills from ground zero. After accepting the things I could not change immediately, I began focusing on changing things gradually. Victory in small increments became an opportunity to celebrate joy rather than the curse of what I wasn’t doing. Confirm your limiting beliefs with openness. It’s very easy to say we can’t do something and I believe far easier in many cases than trying and failing. If we never try at all, then we can’t really have failed and it simply becomes something “someone like me doesn’t do” which is an easy excuse for giving up without trying. If we try, we may have to confront our own determination, discipline and ego, perhaps not in the easiest of ways. The thing is, you may not be able to do something today that a few weeks, months or even years from now you may be able to do. I wasn’t able to hoop as a child but at age 35 I finally learned how after many hours of practice. All of this is to remind you that you are far more capable than you think you are and it’s good to test your edges so you know what’s shifted in which ways. 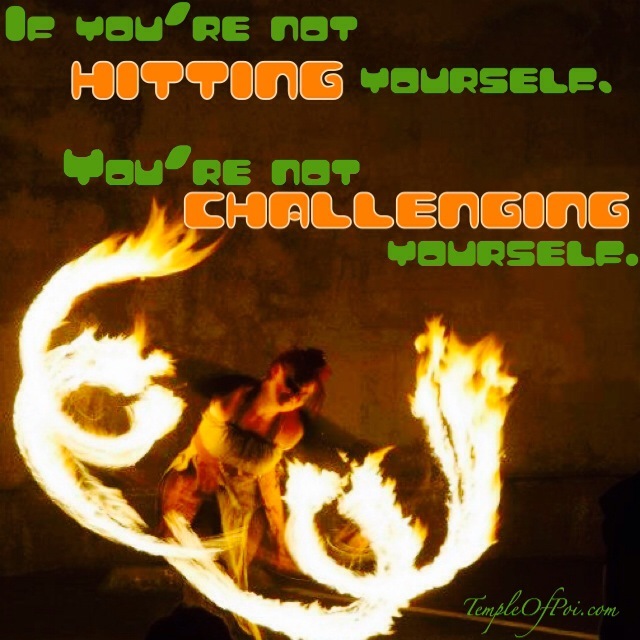 As I like to say to my poi students, If you’re not hitting yourself, you’re not challenging yourself. Need business coaching? Contact GlitterGirl directly or subscribe to our newsletter for mailbox delivery of this and other articles written by Temple of Poi founder and visionary, GlitterGirl, who has been a full time flow arts coach and instructor since 2002. If you seek business training or guidance associated with creating a safe performance, obtaining a permit in San Francisco or other personalized coaching, contact GlitterGirl directly for a free consultation (GlitterGirl <that pretty little ‘at’ symbol> TempleOfPoi <daaaaaaaught> com).